One of the most known corner men as Muhammad Ali’s cut-man Ferdie Pacheco passed away today November 16th in Miami, FL, where he lived passing at the age of 89. Pacheco was married to Luisita and they had three daughters and one son. He was brought up in what was the immigrant community Ybor City in Tampa. He was Spanish-Cuban and his father a pharmacist. Pacheco was bilingual and an artist and author. Pacheco received his bachelor degree from University of Florida and his medical degree from the University of Miami. In attending boxing matches in Miami he met Chris Dundee the promoter who introduced him to his brother Angelo Dundee the trainer of Cassius Clay aka Muhammad Ali. Angelo offered him free passes to the fights if he would “stitch” up his fighters and Pacheco accepted. Pacheco was also a TV boxing analyst for NBC and Univision. He became Showtime’s featured boxing analyst in the early 1980’s and continued doing this until his retirement in the early 1990’s. 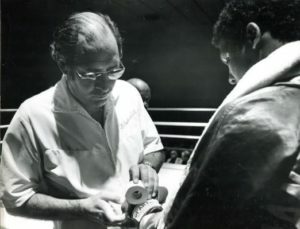 The “Fight Doctor” Ferdie Pacheco dead at 89 but will be long remembered as Muhammad Ali’s personal physician and cut-man.